Are you looking for ways to improve your smile like veneers, teeth whitening and other cosmetic dentistry? Interested in treatments for missing teeth such as crowns, bridges and dental implants? Want dentures to match your unique smile and bite, let you speak and chew comfortably, and improve your appearance and self-confidence? Prosthodontists are specialists extensively trained in the restoration and replacement of teeth. For over 30 years, Dr. Fagin and his talented staff have been helping people achieve the smiles of their dreams. 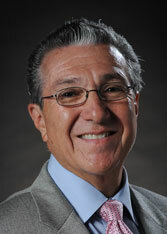 For more information on seeing a prosthodontist visit www.gotoapro.org, a new online consumer dental resource. Are You a Dentist Looking for a Speaker? Learn How To Have Dr. Fagin Speak at Your Next Event. “Thank you very much for the wonderful work you did to fix my smile…I love the results! It looks so natural, as you assured me it would. You assembled a fabulous team of specialists to work with me and accomplish more than I ever dreamed possible.